Walk 1 is in green, walk 2 is yellow, walk 3 is blue, and walk 4 is red. My apartment was the starting point for all but the first walk. My walking adventures began on Monday, when I saw that the weather was going to be warm (yay!) and the skies clear (double yay!) for the whole day. I had considered bicycling across the Tacoma Narrows Bridge before, but I wasn’t sure about the slopes on either end of the bridge, and I also wanted to take some pictures, which is easier by foot. So I decided to walk the whole thing. I actually parked in the lot of the War Memorial Park, which is just east of the bridge. From there I was able to take the Scott Pierson Trail all the way across the new side of the bridge (completed in 2007). I was glad the sun was shining, because the chilly side winds were no joke; I wore my jacket the whole time. I walked from the park all the way to 24th St., which is the first cross-street I reached. It was about 2 miles each direction, and it took about an hour and a quarter to do the whole walk. It was rather nice – there were a lot of bicyclists and other walkers/joggers doing the same thing, though it sure was a loooong way down to that water. I might try this again if the weather decides to cooperate. It had been a while since I’d gone on a walk that long, so I didn’t go out again until Wednesday, and this time I wanted to do a comparatively shorter walk that I’d done before. So I walked down to Titlow Beach at low tide – the lowest tide I’d ever experienced there. I saw some new things, like good-sized crabs shuffling alongside seaweed, and seagulls scavenging now-exposed starfish (like the one above). It’s only about a mile to Titlow Park, but I ended up spending a good hour walking along the rocky shoreline before heading back. This was my most ambitious walk. I had driven to the little park above the Chambers Bay Golf Course before to take sunset pictures (there’s a great view) and had noticed a trail that runs along the top edge of the golf course parallel to the road (complete with many joggers and dog-walkers). I knew it would be a long ways by foot but I thought it was worth trying, as Grandview Drive is very pedestrian-friendly (it passes two schools, and has both sidewalks and bike paths). Again I was surprised by how little I noticed hills while driving in my car, compared to walking. It was quite the workout. From my apartment to the start of the trail was over two and a half miles, about an hour’s worth of walking. I was already somewhat tired by the time I reached the trail, but my curiosity was piqued when I noticed that the trail was not a simple straight line paralleling the street (as I had thought). There was a bend that led in the direction of the shore. Guess who decided to walk the whole thing, just out of sheer curiosity? Luckily, it was a beautiful day. The trail itself was amazing (Yelp reviews agree): it passed a large lawn and a children’s play structure that I would have loved to explore when I was little, and then descended the bluff through a wooded natural area via a series of tight, steep switchbacks that made me glad I was on foot and not on a bike. It came out very near the water, with just train tracks and the beach separating the two. I passed several exciting signs that told me to beware of being pummeled by stray golf balls (enter at your own risk!) and soon realized that the trail actually led through the golf course. Three of the holes were between the trail and the shoreline. Eventually I wound up at the south end of the golf course, where there is a great bridge that crosses over the train tracks to the beach, and a massive Central Meadow (a.k.a. lawn) filled with people sunbathing, flying kites, and playing with their dogs. The slog back up the bluff was the hardest part of the trek, though I was glad I could go up the south end hill instead of the steep switchbacks I had descended on the north end. After that, I took the straight, flat Grandview Trail back the way I had come for a mile and a quarter, and resigned myself to walking the two-and-a-half miles back to the apartment. Total miles walked: almost 9. I decided that the next time I want to walk the trails by the golf course, I’m just going to drive there. I was still a bit worn out from the walk to and through the golf course, but the weather was still amazing, so I walked again today. 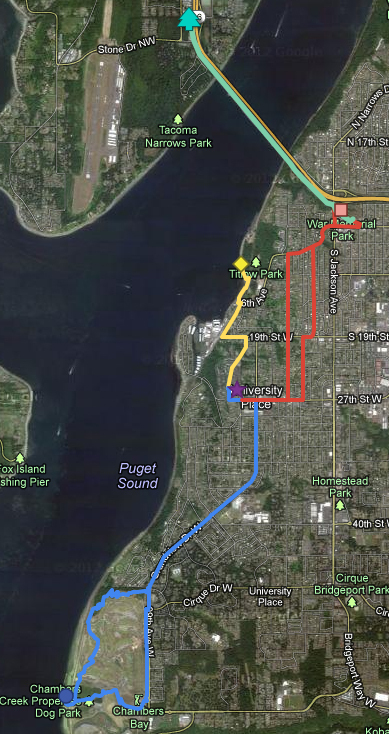 I wanted to do a walk similar to my first one, since that distance seemed pretty manageable. And I wanted to start by going uphill and finish by going downhill. Interestingly enough, I found out that the War Memorial Park east of the bridge is exactly two miles from my apartment, so I decided I would try that as a destination. (Trivia: The park was moved in 2002 to its present location – the original park location was in the path of construction for the new half of the Narrows bridge). I started going uphill via 27th Street rather than the Google-suggested 19th Street, because 27th is much safer for pedestrians (though the sidewalkage is spotty). Then I headed north on Sunset Drive, which was a straight shot to 6th Avenue. It was a pretty quiet, suburb-like street, which actually went downhill gradually – I knew this would mean more climbing soon. Sure enough, I hit 6th lower than I expected to, and ended up scaling another hill until I hit Jackson Ave. Then another downhill spell and I was at the pretty park again. The flowers there are gorgeous right now, and the trees lining its sides are in bloom. I took a slightly different route back, walking the length of the park to cut the corner and come out on 6th Avenue. Instead of taking Sunset again, I opted for another, even quieter road called Karl Johan Avenue. This street is pretty flat, so I avoided further uphill travel. It also features quite the eclectic arrangement of houses: a cute brick house with a neglected, fenced-in tennis court in the front yard, older mid-century homes with overgrown hedges, modern mansions with glass-railinged balconies and electronic gates, a house with Asian influences in its hanging lanterns and pagoda. The road stopped at 19th so I jogged over to Mountain View Avenue and made my way back to 27th, then downhill (whew!) to the apartment again. All in all, I enjoyed my walking experiences. The weather is supposed to change for the worse this weekend, but I hope the skies clear up soon so I can go out on more adventures! This entry was posted in My Random Life and tagged beach, Chambers Bay, Chambers Bay Golf Course, golf, Grandview Trail, hike, Karl Johan Avenue, low tide, Narrows, Scott Pierson Trail, Soundview Trail, Tacoma, Tacoma Narrows Bridge, Titlow Park, trail, walk, War Memorial Park, Washington by CRash. Bookmark the permalink.